Ranma Saotome and his father, Genma, show up at the Tendou dojo after a journey to China. There, the two had fallen into cursed springs. Whatever died in those springs is what Ranma and Genma will turn into. 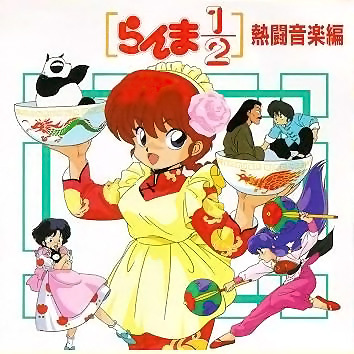 Ranma turns into a girl while his father becomes a panda. However the transition only takes place if they come in contact with cold water. And hot water reverses it. But that is only one of Ranma’s many problems. His father and Mr. Tendou make a deal that has Ranma and Akane, Mr. Tendo’s youngest daughter, both get married so they can take over the family dojo. Until then, they remain engaged and unhappy. Ranma 1/2 was cancelled due to poor ratings, and was taken off the air to be retooled. It was relanched as Ranma ½ Nettohen with a few changes in the staff. A new director was brought on, and Kenji Kawai was brought in to work with Mori. Kawai’s other music work includes many of Mamoru Oshii’s films including Patlabor and Ghost in the Shell. The core art team was retained even though their were subtle differences in their work that became more obvious. The biggest name amongst them is Atsuko Nakajima, who got her start in character designs on Ranma 1/2, and then moved on to do Molediver, Haunted Junction, and You’re Under Arrest. These episodes were shifted around a lot when they were brought to America to hue closer to the original order of the stories in the manga.